Rocky road and cheesecake are two of my favourite things. Rocky road is great because it’s super simple. You mix all of your favourite things together and basically cover them in chocolate. Which is just wonderful. I always think that Rocky Road is basically a hyped up biscuit. And, as a biscuit lover, this is something I’m always happy to make. Cheesecake is a little more complex. But, I favour a no-bake, so not too much. I just love the cheese flavour with the sweet additions. I also love the variety that you can add to them both. 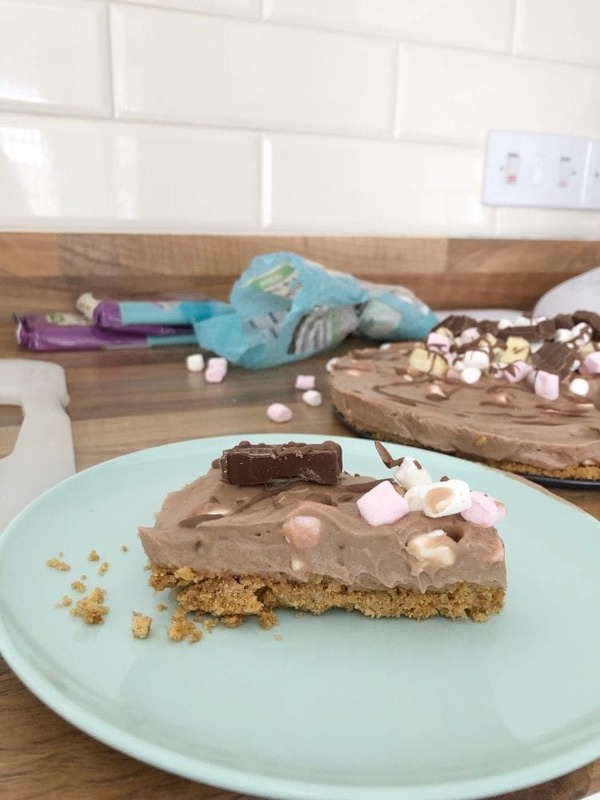 You can add anything to cheesecake and stuff anything in a Rocky Road. 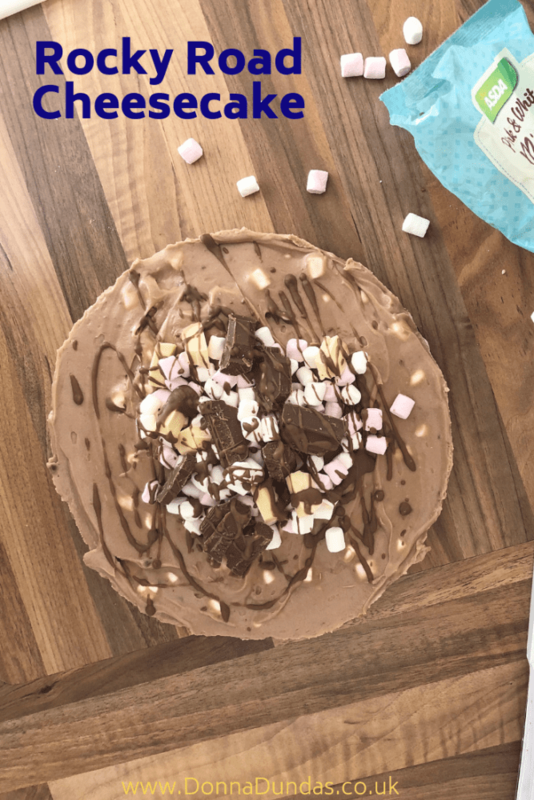 So, putting them together in a Rocky Road Cheesecake is just the best of both. Since I’ve started making my own cheesecakes, I’ve started to become more disappointed with many store-bought options. You just can’t taste any cheese in them. The other flavours just override the cheese. Homemade is much better because you can mess around with the quantities until you find just the right cheesiness for your own tastes. When it comes to Rocky Road, I like to add some fruit. Usually cherries and raisins. I like the change of texture and taste that it adds. I also love a fruity cheesecake. Much more in fact than a chocolate one. But, I haven’t added fruit to my Rocky Road Cheesecake. 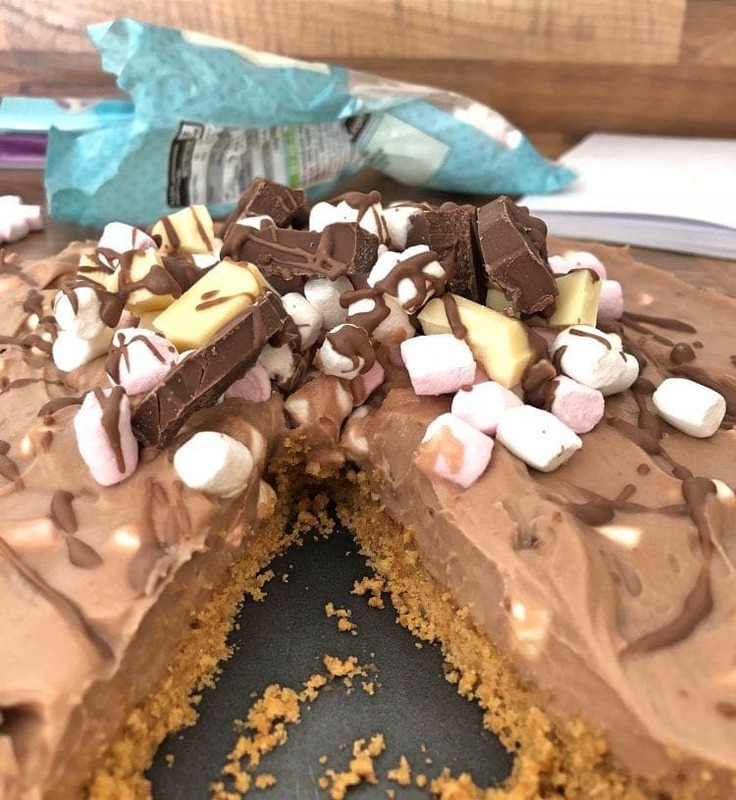 You could add some chopped glace cherries to the top if you wanted to, but I’ve stuck to simple chocolate and marshmallows. I really like this Rocky Road Cheesecake. The cheesecake mixture itself is flavoured with milk chocolate. But, not too much. It’s not a rich flavour, just nice and creamy. There are then marshmallows added to the mixture, which taste and feel amazing. On the top, I went for some more marshmallows, white and milk chocolate chunks and chocolate drizzle. As I say, you could add some fruit, or nuts here too if you wanted. 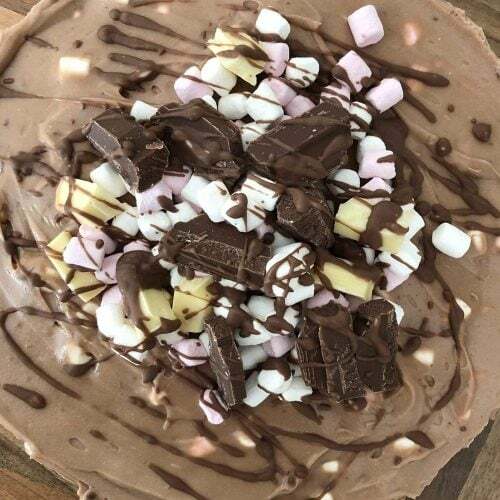 Think about what’s in your favourite rocky road and throw it on top! As well as the ingredients you’ll need a loose bottomed cake or pie tin. I use a deep 9” cake tin. A mixture of two classic treats.